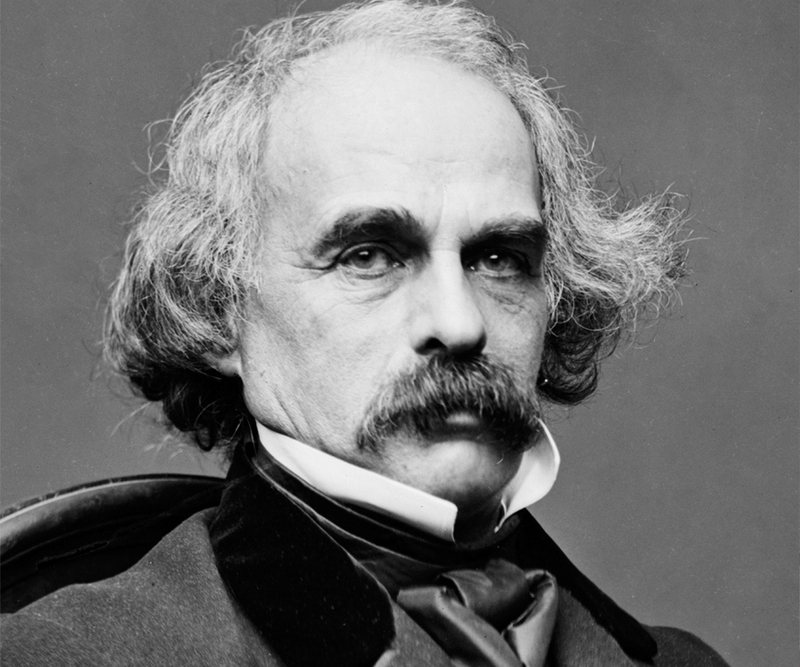 Nathaniel Hawthorne was born on July 4th, 1804 in Salem, Massachusetts. His father was also named Nathaniel Hawthorne, and his mother was Elizabeth Clarke Manning. Hawthorne was raised in a Puritan home, and was raised quite religiously. Having been born in Salem, the home of the Salem Witch Trials many years ago, Hawthorne was very familiar on the subject. In fact, one of his ancestors was a judge during that awful period in time. John Hathorne was the only judge in Salem who did not repent of his misdeeds and sins during the trials. Soon, Hawthorne met a young woman named Sophia Peabody in 1838. Sophia had previously suffered from multiple illnesses, such as migraines. However, after she met Hawthorne, the illnesses Sophia previously had suffered from seemed to vanish as if by magic. There was clearly chemistry between the two, and they were married in 1842. They moved all around the country as Hawthorne continued to write his stories and obtain publishing deals for all of them. With many novels released between 1850 and 1860, Hawthorne’s best one was The Scarlett Letter. This novel is the one he is best known for. Hawthorne died on May 19th, 1864 at 60 years old. Hawthorne used many literary devices well throughout his writing. One of them was foreshadowing in The Birthmark. In this story, Georgiana’s death is foreshadowed in part by all of Aylmer’s previously failed experiments. Close to none of them resulted in the way Aylmer had intended them to. Aylmer’s experiments seemed to always fail and tended to have destructive consequences. It is therefore reasonable to assume that this attempt will not work. Aylmer attempts to remove the birthmark from his wife’s face, and he fails. This leads to much, much more destructive consequences than any of his previous experiments. Another literary device Hawthorne used was irony. In The Birthmark, Aylmer is very intelligent, though ignorant at the same time. He has seen that most of his experiments have ended in failures. His ideas for the experiments are decent, however, he ignores the failed results that come from these experiments. Aylmer is ignorant of the fact that he could hurt his wife with this experiment. This does not affect his adamant attitude that this experiment will be the one that works. However, because of his ignorance, Aylmer loses his wife to yet another failed experiment. In Hawthorne’s short essay, On Solitude, he is writing to Henry Wadsworth Longfellow on why he has chosen solitude as a means to write good stories. How does Hawthorne regard his solitude? How does he feel it has affected his life and writing? Hawthorne believed that his solitude had given him a new look on life, as one may say. He saw things from a different perspective, and that affected his story writing. Hawthorne said that he dreams about living, and in a way, he found that he could live through is writing of books and stories. Hawthorne is an author worth studying because he obviously put much thought into what he was writing as he wrote it. May authors will, of course, do this, but Hawthorne did this very well, much better than others. He considers the deeper meaning of the stories as he wrote them, not after. He makes the reader think about the stories in a deeper way just by reading them. Robert Frost was born in San Francisco, California in the spring of 1874. His father, William Prescott Frost, Jr., was a teacher at the school, and his mother, Isabelle Moodie, stayed home and took care of Robert and his siblings. His father died when Robert was only eleven years old. This force the family to move across the country to Massachusetts to live with William’s father, William Prescott Frost, Sr. It was here that Robert received some of his best education, as his grandfather wanted Robert to learn. After high school, Robert began working on poetry. It greatly captivated him, and when he was twenty years old, in the year 1894, Robert sold his first piece of poetry to the local newspaper. He realized that this was his calling, and that this was what he really loved to do. He soon met and married his wife, Elinor Miriam White Frost, and moved to New Hampshire to a farm that William Frost, Sr. had bought for the both of them. It was here that some of Frost’s best work came about, as much of it was inspired by the New Hampshire land. Robert’s life was not an easy one. As previously stated, his father died at a very young age. His mother died what Frost was 26, and two of his sisters had to be admitted to a mental hospital, only to die a few months after. Frost had six children, but only two of them outlived their father. One of his children died at just three days old, another died at six years old from tuberculosis. This no doubt strained Frost to his limits at points, as losing a child is very difficult. In his poems, we can sometimes hear the despair coming from Frost as he laments the loss of his family. Robert Frost was one of the most amazing poets of the 20th century, nonetheless. He brings so much personification, metaphors, and similes into his poems it’s hard to keep track sometimes. He is one of the most recognized poets, as well as the most studied. Robert Frost died in early 1963 due to prostate surgery. He is buried at Old Bennington Cemetery in Bennington, Vermont. Rationale for selection: In this instance, Frost uses anti-personification. He says that the moth is like a cloth. Not many times do poets compare a living object to a none living object. It is obviously the other way around, hence the very definition of personification. It is a different way to use personification, and it is very creative too. Rationale for selection: A house can’t bring anything to anything. This is obviously personification, as a house cannot move. At first, though, reading just this line can be very confusing. It is only in the next couple lines that the reader realizes that the sunset glow at midnight is really a house fire. This is very poetic and a good use of words to bring the house alive. Robert Frost is probably one of the most recognized poets ever. When even non-poets here his name, they most likely will remember that he was a poet. He had a unique sense of watching the world and bringing the beauty of poetry into our life. The way his poems let us see the world could be compared to an optical illusion. We can see the world for what it is very easily. However, Frost, through his poetry, gives us another way to look at it. Most of his poems were like that, and that is one of the reasons he was and is so well known. Another reason why Frost is so well known is the reason that we can learn from him by looking at his life, not just his poetry. As previously stated, Frost seemed to be a very serious man, because many of his children died, his dreams for his family seemed to be crushed as soon as the begun, and other things. Though all of these were devastating, Frost did not give up what he loved most. His circumstances did not change his attitude toward his passion of writing. He was not only a very serious man, but an adamant – possibly stubborn – man as well.